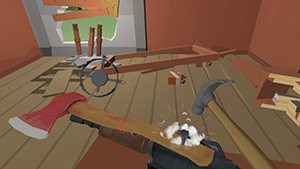 In this page, you can find a list of zombie-themed virtual reality games. I personally got into the Zombie games when I first played Plants vs Zombies Garden Warfare, followed by Call of Duty Zombie mode and since then I am just hooked on any videogame that has zombies in it. 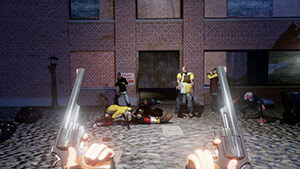 First-person zombie shooters are favorable many by a lot of gamers and in fact, most games who feature zombies are actually first-person shooters. It seems that gamers just enjoy shooting up those creepy mutated creatures and blowing them up to pieces. 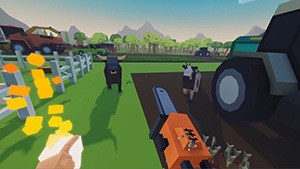 Among the most highly-regarded zombie VR games we can find games like Drop Dead, ZR: Zombie Riot, Arizona Sunshine, VRZ: Torment, Into the Dead and Dying Light. All of these games told us that you just can't have enough of those creepy creatures and people just love to see them in games. Not every zombie game has to be a horror or a shooter, some developers just use them to spice up their game, like Dead Hungry, where you need to serve hamburgers to hungry zombie customers or in Modern Zombie Taxi Co., a hilarious VR game in which you need to drive some crazy zombies to their chosen destination. 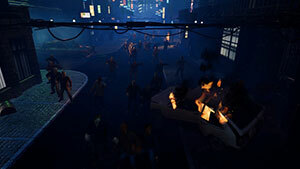 Many of the zombie games tell a story of an apocalyptic event and the players need to survive and fight the mutated humans that turned into zombies. Some of them were inspired by popular zombie movies like World War Z and PC zombie games like Left 4 Dead, DayZ, Dying Light, H1Z1 Just Survive, Plants vs Zombies, Dead Rising, Call of Duty: Zombies and many others. So what games can you find here? Well, we do out best to list all the best, both free and paid, latest and upcoming zombie VR games in any genre and for any VR platform and headsets, like HTC Vive, Oculus Rift, PSVR, Google Daydream, Samsung Gear VR, for both PC (Windows), PS4, Android, iOS and other platforms that have VR games that support the common VR hardware out there. This zombie VR game list is updated on an ongoing basis, so don't forget to bookmark this page and visit us often to discover more zombie games to play. 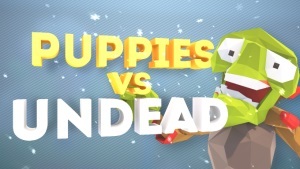 Puppies vs Undead – an exciting Tower Defense board game. Plunge into the world of magic and wizardry, where all the toys come to life! Build different towers! Manage the weather! Protect the portal from enemies! Upgrade your weapons, lay out your strategy and get ready for battle! 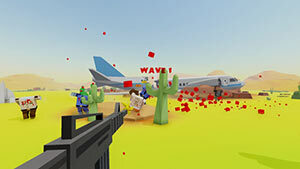 Turret Syndrome is a first-person tower defense game for Oculus Rift. You work as a security guy in an isolated house. It's your job to protect the guard house from mutant zombies that try to overrun it. 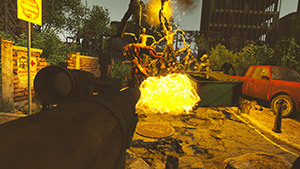 Zombie City is an apocalyptics zombie first-person shooter. 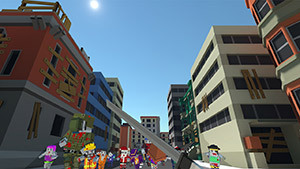 The zombies have taken over the city, you need to arm yourself with all sorts of weapons and items and fight off hordes of freakish zombies. It's an endless waves survival game. In each successful wave, you'll gain more resources that will help you survive longer. 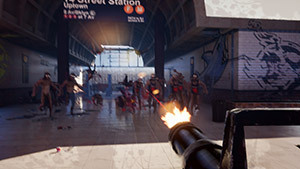 Dawn City is a first-person VR shooting game for HTC Vive. 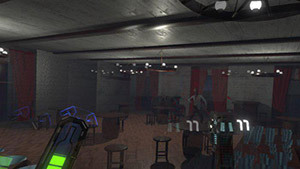 The player must survive a zombie attack. 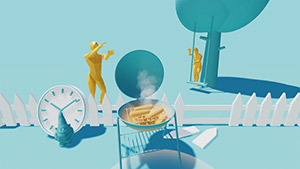 The game's difficulty increases as the time goes on. How many zombies attacks can you survive? 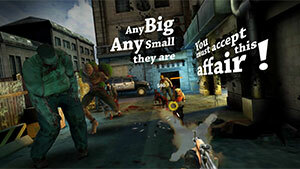 Zombie Nightmare is an action wave shooter in which the player needs to defend himself from waves of zombies. The game takes place in 4 large maps, each map consists of several waves. Design and then improve the ultimate mothership. 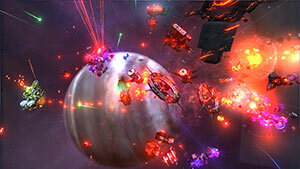 Explore a persistent living galaxy populated by 200 unique captains that can do everything you can do. Survive the zombie infection and then fight them back. 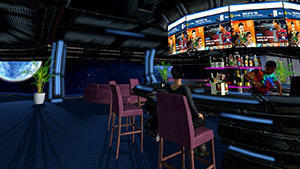 AlterVerse: Disruption is an MMO taking place in a vast expansive universe. It's the first in a series of games set in the AlterVerse. You play as a captain who commands his own spaceship which you need to save from imminent destruction in a times quest. You can rad other people's ship in the multi-player mode and defend your own. The are many other cool quests and activities waiting for you in the game.